• Gift Mobile data to friends and family. • Get unlimited international calls and text to 33 countries for $5 per month. • All plans come with Data Vault. You keep all your unused data, forever! • No lock in contract. • Data-free streaming of sport, music and entertainment. EXPIRY Recharge every 30 days. • 50% OFF for 3 months! Use promo code 'SCHOOLHOLS' during signup. For new customers only. Ends 12 May 2019. T&Cs apply. • No Lock-in Contract. Free delivery! • Plus up to 10GB streaming data only on Netflix, Stan, ABC Kids, ABC ME and ABC iView. Positive MyData balance and subscriptions required. Unlimited standard national SMS and MMS. Up to 100 mins (charged per min) of standard national calls. Data will roll over up to 50GB when you recharge before expiry. EXPIRY Recharge every 5 days. All for use in Australia. Fair Go Policy applies. Bonus Offer: Bonus data may take up to 72 hours to be applied and will expire at the same time as the standard inclusion, unless data roll over applies. Subsequent $10 recharges will give 500MB data. Excludes SIM swaps. Not to be used with any other offer. Limit once per customer. Compatibility: If you bring your own device, make sure it's not locked to other networks and is compatible with the Optus network. To learn more, visit optus.com.au/compatibility. • Unlimited standard international calls to 20 selected destinations. • Data Bank - Save up to 200GB of unused data when you recharge $10+ before expiry. • Suitable for roaming overseas. Use included _Extra Credit to make or receive a quick call overseas or buy an International Pack to use data while overseas. • Data free streaming of Apple Music, AFL, NRL and more. Free Wi-Fi with Telstra Air. Australia's biggest 3G + 4G network. Telstra Prepaid Extra Plans: Data bank when you recharge $10+ before expiry. Access your Data Bank when you have an active recharge. Day2Day plans. International Minutes charged per destination when first eligible call is made. (Automatic top up of data in 100MB bundles.) See Telstra.com.au for terms and conditions. • 30 Day Network Guarantee - Sign up to 12 month plan and cancel within the first days with no fees! • Unlimited international calls & text to 33 selected countries. • Grab a $30 SIM for 1/2 price - now $15! Offer ends 29.4.19 11:59PM. • 4G on the FULL Telstra Mobile Network. • Roll over unused data to your next recharge. • Data Free Music streaming of Apple Music. Unlimited international standard calls & text to 20 selected destinations plus 100 standard mins & text to 35 selected destinations. EXPIRY Recharge every 28 days. • FREE Cyber Safety + Parental Control software. Buying a phone plan in 2019, what’s changed ? Are you looking to compare Australian mobile plans? 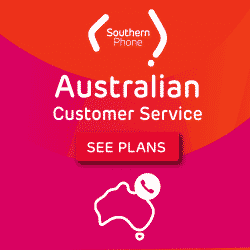 Our website is designed to give you the insider information you need, in order to be able to compare the best phone plans on the Australian phone market. We surveyed hundreds of Australians so we could give you the information you need to make an informed choice in 2019. Here’s what we learned. While you’re researching, are you finding words or jargon you don’t understand? Are you struggling to know where to start ? Use our guide to get headed in the right direction and to demystify the lingo. If you don’t have long to do your research, check out our infographic. (Below on this page.) It offers a quick overview of the key trends, and the facts and figures you need to know about how to compare plans. 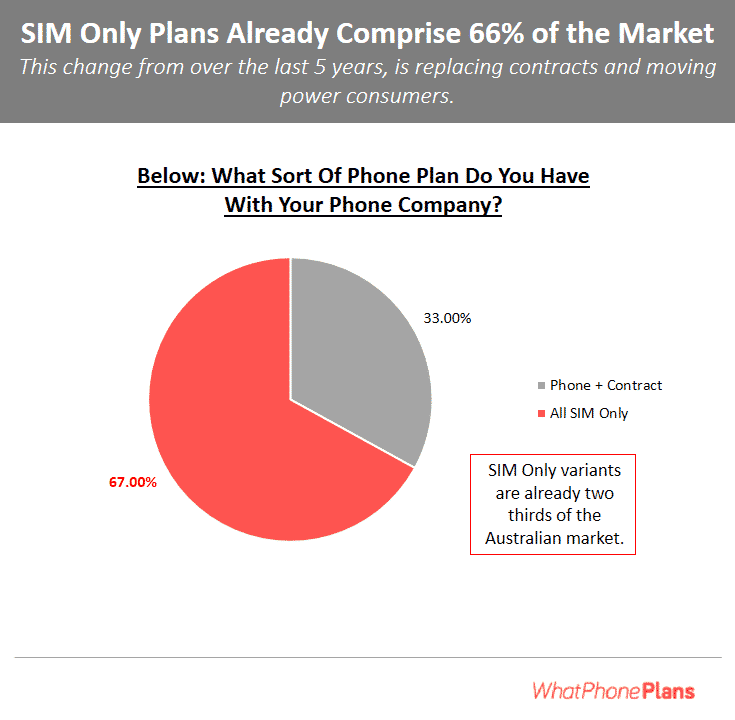 Only 7% of Australians are committed to comparing phone plans in the year ahead. We look at phone plan buying behaviors so you can see how you can stay ahead of the pack this year. We explain the way the phone market has changed in recent months – and why you just got a lot more power than you used to have, when it comes to picking phone plans. The 4G networks are all remarkably similar now, SIM Only plans have taken over and, most importantly, a lot of people now buy their phone plans from smaller phone companies. In the ‘3 biggest trends’ section we explain each of these situations – in our view, this is the most important information to bear in mind when you’re picking your plan. Pick a smaller phone company and you’ll get up to twice as much data per GB than you would if you went with a bigger phone company equivalent. Our survey revealed that customers of smaller phone companies are happier with their phone service, on average, than customers of big phone companies. Why pay more to be miserable? We show you the statistics so you can make your own choice. Many people don’t realize that if you pick a small phone company, you’ll get exactly the same coverage, speed and priority as customers of the bigger phone companies. We explain how the system works so you can make the right decision. Customer satisfaction with phone plans is going to go up. We explain why and how you can harness the trend. People are using personal health tracking equipment at a rapidly rising rate. We explain what that means to you and your phone plan. 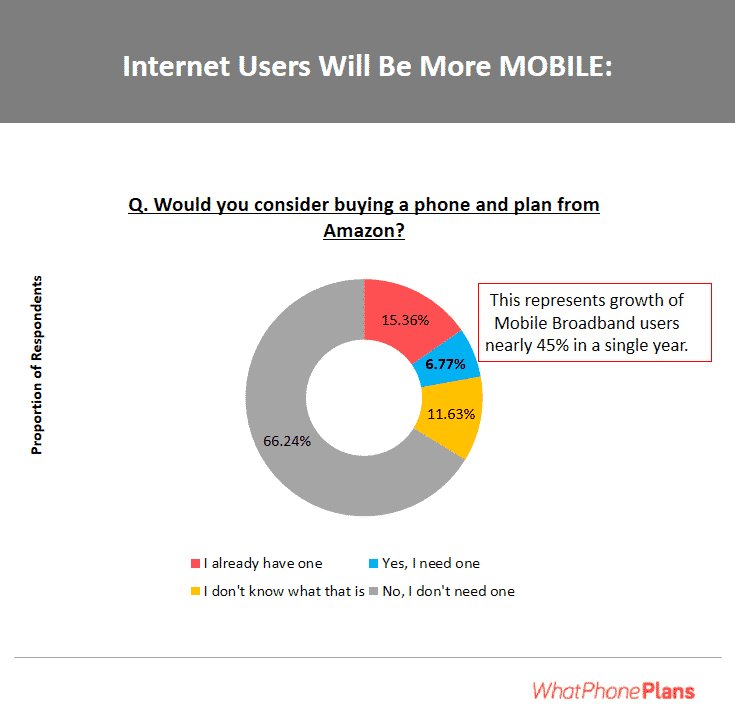 Phone plans are now being tailored by users to meet their specific needs. We examine the trend so you can use it to your advantage. Mobile Broadband is taking off. We explain why and what it means for you if you’re thinking of getting a mobile broadband SIM. Finally, we consider other ideas to bear in mind when comparing phone plans. In this special section, we cover everything else you could possibly need to know. We want to offer you the support you need while you shop. If you want a written record of the key information we offer on this page, you might like to download our FREE information pack. It explains every phone company related technical term you’re likely to bump in to, it gives you a visual guide to navigating the maze of phone plans and best of all, you won’t pay a penny for it. 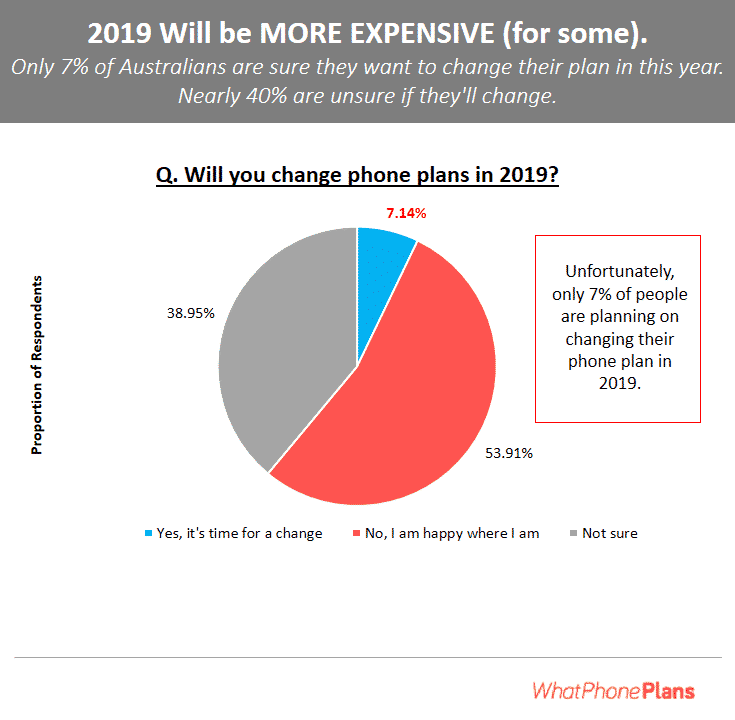 Perhaps the most important trend this year, when it comes to keeping your costs down, is the low proportion of people who intend to change their phone plan over the next 12 months. Busy lives mean people don’t have the time to compare. Only 7% of Australians offered a definitive ‘yes’ when asked if they intend to compare their phone plans. That’s a shame. The truth is that comparing and buying a phone plan typically takes 15 minutes or less. Here are the steps to follow. 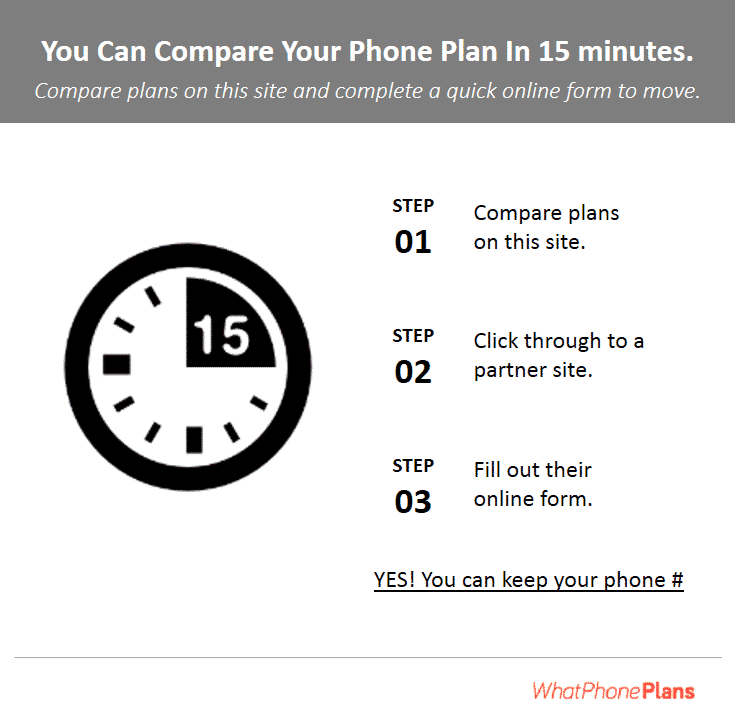 You can compare phone plans and move to your new provider in under 15 minutes. As we mentioned in the intro, comparison shoppers – like you – have a lot more power now than they ever did. Here’s why the power has shifted to consumers and what that will mean to you. There are a lot more phone companies out there than you might think. Our site provides information from people who used to work in the phone companies so you know what they know. The information is provided free of charge alongside the plans we’d recommend. New entrants in to the market like Moose Mobile on the Optus network, Belong Mobile on the Telstra Mobile Network and Kogan Mobile on the Vodafone network are bringing new things to customers. In 2017, we saw ‘data vault’ released as a product feature for the first time. Once you’ve bought your data, it’s yours forever! Competitors are falling over themselves to improve their products, critically, making them fairer than they used to be. You now have more choice across more products than ever before. The biggest shift has been a move away from buying phones under more expensive contract from your phone company and towards SIM Only deals. More on these trends below. Prepaid plans has always been around 45% of the Australian market. The reduction in the number of contracts sold has led to a rapid rise in postpaid SIM Only plans. 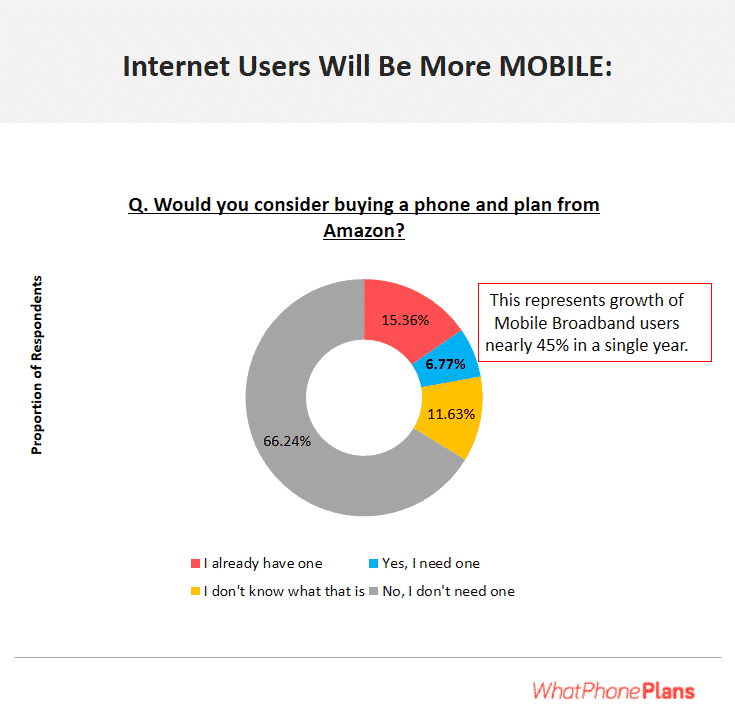 People are now far more likely to buy their phone outright and add a SIM than they ever have been before. Comparing phone plans is more likely to involve a comparison of SIM Only plans than phone contracts. As well as saving a ton on the total cost of ownership with a new phone, having a mobile plan out of contract helps with the management of your rising data needs. We’ve been brainwashed in to believing that Telstra offer the best network, haven’t we ? Well, here’s a surprise for you. 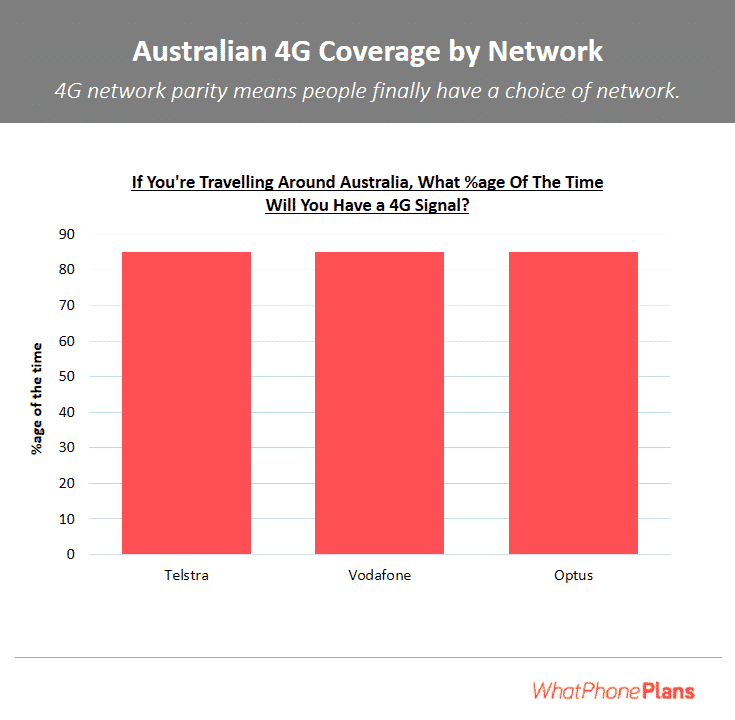 Both Optus’ 4G and Vodafone’s 4G networks are on a par with Testra’s for both coverage and speed. It’s not just us who think it. OpenSignal are one of two independent companies which have compared these networks in studies the Australian coverage of all 3 major phone companies. The results are consistent and remarkably clear across all the surveys which have been run. When it comes to 4G data, there is very little to pick between the phone companies. The coverage and performance of all of the major 4G networks is now about the same. Unless you are one of the 2-3% of people who live in the outskirts of Australia, whichever network you get, Optus, Vodafone or Telstra, the availability of 4G signal you receive and the speeds you benefit from will all be the same. You can find out more about Australia’s network coverage information on our dedicated page. Note : It’s true to say that Telstra’s 3G signal covers twice the land mass of Australia as either Optus or Vodafone. We have dedicated article on the subject here. As if competition between the big phone companies wasn’t enough to push down prices, here come the smaller phone companies. 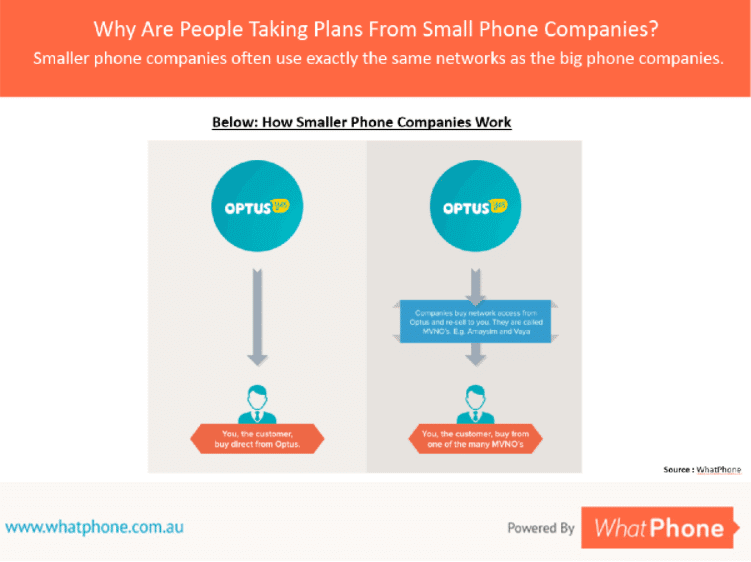 Collectively known as MVNOs, smaller phone companies generally, with the exception of OVO Mobile offer more basic phone plans than Vodafone, Telstra or Optus. They’re doing that successfully, as you will see from our chart, below. Their share of the market is large and growing. A full 50% of new phone plan sales were to smaller phone companies. On average, people who pick a small phone company are more likely to be satisfied with their phone service than those who pick a big phone company. If you want to be happier with your service, pick a smaller phone company. 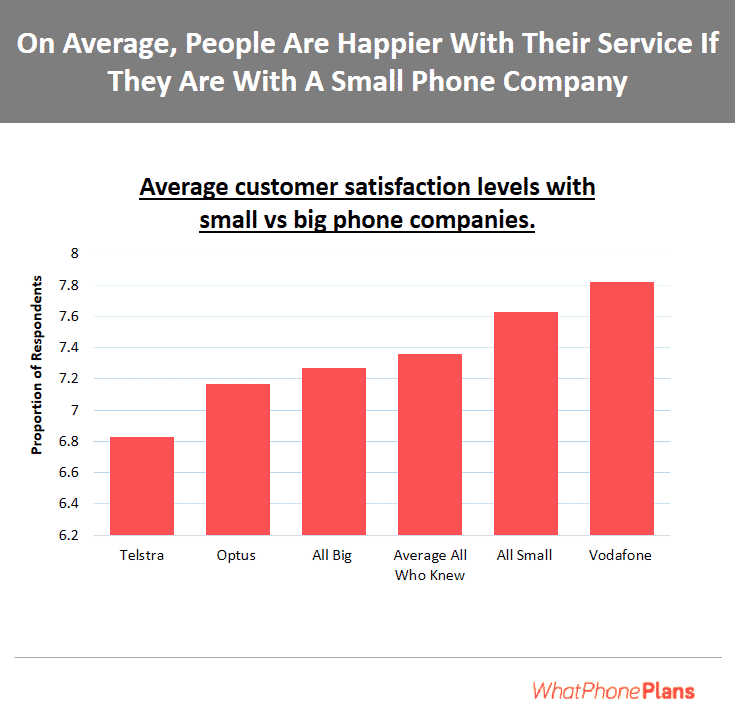 Examining the detail of big company vs small company customer satisfaction levels in our survey, reveals that, on average, customers of small phone companies are happier than customers of big phone companies. Vodafone is a notable exception. The primary plan feature people compare these days is the data they’ll get per dollar spent in their phone plan. The third and final reason small phone companies are doing so well is that they offer more data at each spend level. Here’s just one example. You can get twice as much data, for the same monthly spend with smaller phone companies. Note, many bigger phone companies offer value added services that the smaller telcos don’t. You are unlikely to know how phone companies really work unless you have been employed by one. Smaller phone companies actually resell the big phone company networks. Here’s how they function. Remember, whether you go with Optus or one of it’s resellers, you’ll get the same network. 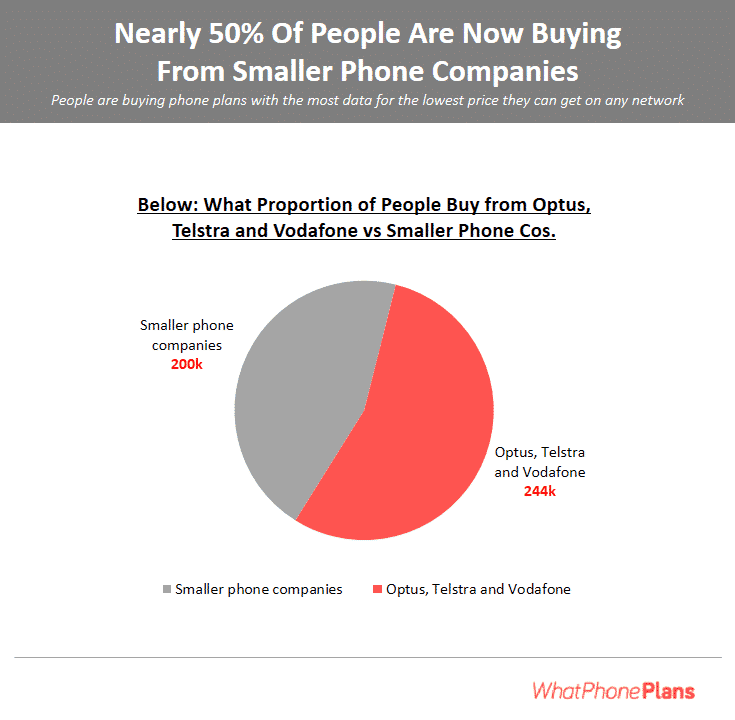 Australia’s big phone companies are Optus, Telstra and Vodafone. Examples of smaller phone companies include Amaysim and Boost Mobile. Smaller phone companies resell the big company networks. You will often get the same coverage and priority if you go to a small phone company, as if you went to a large one. The practical reality is that you can cut your phone bill by going to a smaller phone company – and often get exactly the same network. Our research shows that this year is going to be even better for consumers than last year. Our survey revealed that there will be a 22% increase in the number of people using the Self Service app their phone company provides. Self service apps are the number 1 way people can improve their level of customer satisfaction – essentially how happy they are – with their existing phone company. Most phone companies offer a free, downloadable, Self Service app which can be used to manage your account. It tracks your bills, data usage, and can answer simple questions you might have. Installation takes seconds. I you install the app on your own phone, the phone company will identify you through your phone number and there are no login details required. People should download these free apps. As you will see on the next diagram, they will make you happier with your service. From the phone company side, there is an education gap around the self service app. Nearly 20% don’t know what these self service apps are is and less than 10% intend to try it in the year ahead. The range 7-10 out of 10 on a customer satisfaction score is often called the ‘Net Promoter Score’. 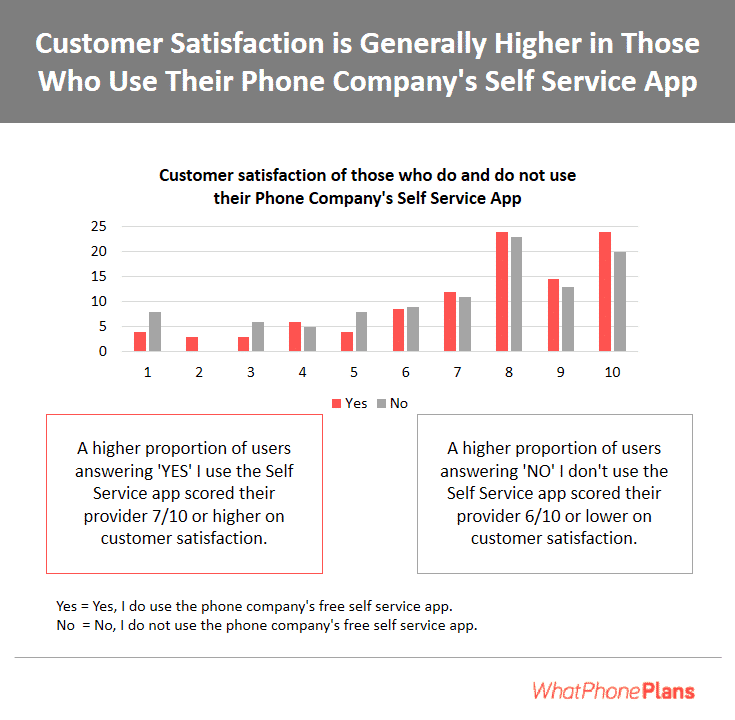 People are far more likely to give that sort of ranking to their phone company if they use the Self Service App. As the chart and our survey shows, a higher proportion of users ranked their telco with 7-10 out of 10 on a customer satisfaction scale, than those who did not have the app installed. The ‘Internet Of Things’ (IoT) is a term used to describe gadgets which are connected to the internet. Wearables are a great example. Your Fitbit or Apple Watch is increasingly likely to come with it’s own SIM card installed. SIM cards too, are an area of innovation with the Apple Watch containing a new ‘eSIM’ which promises to make future wearables smaller and easier to connect to cellular networks. Wearables are primarily used to measure health and fitness related information. Australia is known as a country of ‘early adopter’s. It’s us who took to Social Media first in huge numbers and bought iPhones faster than other countries. The same is proving true of Australian adoption of wearable devices. The growth in the number of Australians prepared to try a wearable is similar to that we saw with SmartPhone adoption 10 years ago. 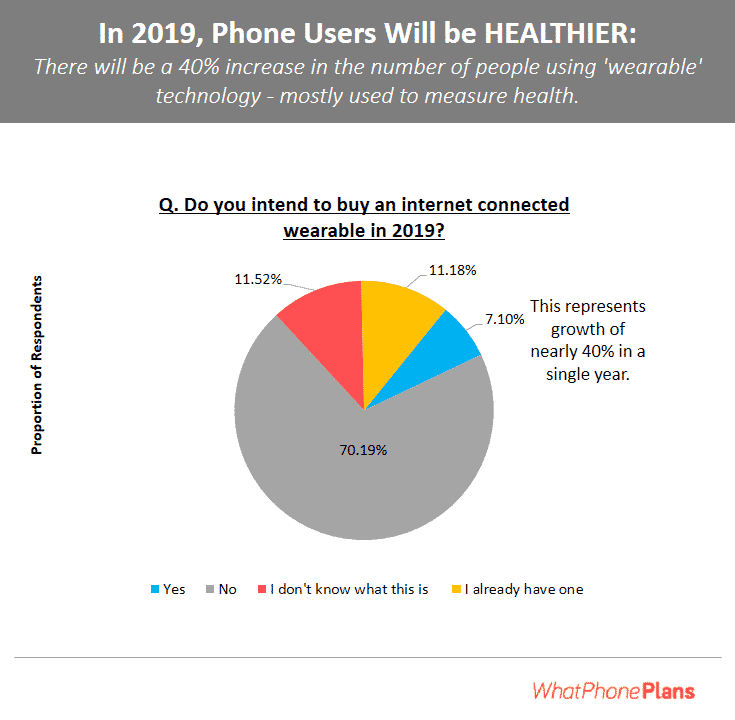 Our survey indicated that 7% of people already had an internet connected wearable at the end of 2017 and that number was set to grow by 40% in 2018. Wearable technology is going to be a key trend as these numbers from 2018 show. All these wearables will need a wireless / cellular data connection. The most important ramifications of this trend will apply to phone companies. Individuals now have and need multiple SIMs, often with a single phone number, as we saw with the Apple Watch. Phone companies have invited technology to deal with this need. Telstra, for example, provide a ‘One Number’ solution for the Apple Watch 3. Ironically, although Telstra and others among the big telco brand have had challenging times recently, their billing system facilities may help them win back the customers they’re losing. It’s only the big phone companies which offer data sharing, which, as we connect more and more of our possessions to the internet will become exponentially more valuable. One of the biggest trends which has revealed itself irecently is the uptake of mobile broadband plans which Australians invested in for the first time. We saw an enormous amount of interest in these relatively new plans. Phone companies have offered data only bundles for tablets and laptops for many years. Data allowances tended to be small – below 20GB per month, for example. Recent years have shown a change in both the size and affordability of these data plans. Mobile Broadband bundles 30GB or more really took off in 2017. 2018saw this growth continue. Mobile Broadband does many of the things people value better than fixed alternatives. is cheaper, faster and perceived to be more reliable than fixed connections, particularly the NBN. Mobile Broadband services meet needs that fixed broadband does not – entertaining the kids with You Tube on long journeys, helping students and business people work wherever they want to. Given the problems NBN customers have experienced, it could be that mobile broadband grows in to a threat, perhaps even a replacement for NBN broadband connections. These are pivotal times for the NBN. Mobile broadband threatens their entire investment. It may not feel like it but things are moving fast. In the last few years alone, we’ve started buying our phones ourselves, adding SIM plans we’ve found, often from smaller phone companies. We’re taking advantage of the fairer plans which some companies offer. We’’re connecting more of our possessions and gadgets to the internet and adding mobile broadband connections to our list of phone services, in some case replacing fixed NBN connections with them. It’s not hard to imagine an Australian buying an Apple Watch from Amazon, an iPhone from MobileCiti and adding a Kogan which provides data to both. The same individual may also invest in a mobile broadband connection, say, from OVO, one of the leaders in that particular field. The next generation of advances in telco, are likely to be in the area of improving the customer experience around managing these multiple SIMs. Phone bills already take up around 5% of Australian income. It’s time the phone companies started giving us the tools to limit the cost of these additional connections. After all, it’s them who are trying to sell those new services to us. Thales and Telstra join together to make airspace safe. Source. Telstra and Thales join to make low-altitude airspace safe and effective. Telstra, Australia’s leading telecommunication company, has announced a partnership with French-based aerospace and defense firm Thales. This partnership aims to manage the low-altitude airspace that is used by manned and unmanned aerial vehicles.